OAKVILLE, ON, July 14, 2014 /CNW/ - Canadians are increasingly looking for green products and services, and many are even willing to pay more for them, but they may be selective on which they choose based on the strength of environmental claims. The findings, that suggest an important shift to mainstream green purchasing practices, are a result of an inaugural survey on green purchasing behaviours and attitudes in Canada commissioned by SCA, the maker of the Tork® brand of away-from-home hygiene products. As an international leader in creating an ethical and sustainable marketplace, SCA worked with Leger in Canada to capture in-the-moment consumer insights that reflect market trends. "The key takeaway for Canadian organizations is that 86 per cent of Canadians are buying green, so products and services with environmental claims are likely a fundamental driver in a customer's purchase decision," said Mike Kapalko, sustainability marketing manager for SCA's North American away-from-home professional hygiene business. However, most of those purchasers look for third-party certification (33 per cent) or conduct their own research (24 per cent) to verify claims. This fact combined with the knowledge that their prime purchase driver is the care of the environment itself (48 per cent) rather than other motivations means organizations should showcase their environmental commitment beyond their direct business offer. "It's not enough to say something is biodegradable or sustainable to keep ahead of the curve," said Kapalko. "If they haven't already, companies will need to determine how to incorporate meaningful sustainability strategies into their business and production practices. This could mean finding new suppliers with sustainable alternatives, or identifying operational areas of 'green improvement' that are cost effective and efficient." Whether they are early adopters or just picking up on the trend, Canadians on the whole are strong believers in green products and services, with 43 per cent believing that it is just getting started, and 39 per cent believing it is the new norm. An interesting nuance in the Canadian study is found in the age and family demographics of 'green shoppers'. 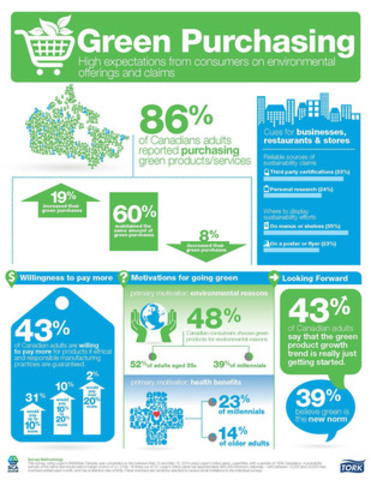 While surveys in other geographies indicate a strong propensity for millenials (under 34) to lead the pack in adopting green purchasing habits, in Canada the survey results suggest that older green shoppers are more likely to do so because it is better for the environment (52 per cent of Canadians over 55 vs. 39 per cent of Canadians under 34). In addition, households with children indicated a stronger likelihood to purchase green products and services (91 per cent) than the 84 per cent of respondents without children. "A clearly optimistic finding of this survey is that 'green' products and services are no longer subjected to the forces of the economy," says Kapalko. According to the Tork Green Business Survey, for most 'green' consumers in Canada (60 per cent), the recent economic changes have had no effect on the amount of green products or services they purchase. Actually, one-in-five (19 per cent) 'green' consumers have increased their green purchase habits, while only 8 per cent have decreased that amount as a result of economic conditions. Only one-in-six Canadians surveyed did not buy green products. 2 per cent would pay over 20 per cent more than they pay today. These findings are tempered by income levels and education, as Canadians with household income under $40,000 are less willing to pay more for a product manufactured ethically (58 per cent vs. 40 per cent of Canadians with greater income). This survey, using Leger's OMNIWeb Canada, was completed online between May 12 and May 15, 2014 using Leger's online panel, LegerWeb, with a sample of 1,504 Canadians. A probability sample of the same size would yield a margin of error of +/- 2.5%, 19 times out of 20. Leger's online panel has approximately 460,000 members nationally - with between 10,000 and 20,000 new members added each month, and has a retention rate of 90%. Panel members are randomly selected to receive email invitations to the individual surveys. The Tork brand offers professional hygiene products and services to customers ranging from restaurants and healthcare facilities to offices, schools and industries. Products include dispensers, paper towels, toilet tissue, soap, napkins, and industrial and kitchen wipers. Through expertise in hygiene, functional design and sustainability, Tork has become a market leader. Tork is a global brand of SCA, and a committed partner to customers in over 80 countries. To keep up with the latest Tork news and innovations, please visit: torkusa.com or tork.ca. SCA in Canada operates nationally employing 280 people with head offices in Oakville, Ontario and manufacturing facilities in Drummondville, Quebec. SCA delivers sustainable solutions with added value for our customers from safe, resource efficient and environmentally sound sourcing, production and development. Recent third party accreditations for the SCA sustainability work include Dow Jones Sustainability Index 2013, the WWF Environmental Paper Company Index 2013, and Ethisphere - World's Most Ethical Companies 2014.